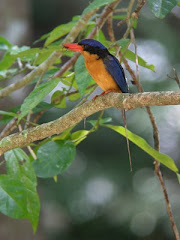 Red Mill House - Daintree Birdwatching: Paradise Kingfishers - colourful and stunning. Paradise Kingfishers - colourful and stunning. 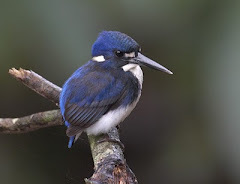 One of the great joys of spring in Daintree and the Wet Tropics is the return of the Buff-breasted Paradise Kingfisher from New Guinea every year to breed. Arriving in late October ( a little early this year), they call madly for mates from high in the forest for the first few weeks, making them easy to locate. They will soon settle down to nest in the terrestrial termite mounds on the forest floor of lowland and mid-level rainforest. The colours are extraordinary, with a bright red bill and red feet, a bright orange breast, bright blue back and head with black markings, and a long white tail and patch on the rump. As the bird calls the tail flicks up and down, and is often the first thing you see. This bird is a favourite with visiting birders and we locals alike, and they can be seen and heard at the moment along Stewart Creek Rd in Daintree.